Khawaja sure proved this bloke wrong. USMAN Khawaja has left his rough Australian summer on a high with a stunning 101 not out in the second innings, pulling Australia into a near undefeatable position going into day four. A strong morning session with the ball left Sri Lanka skittled for 215 at lunch. From there the match was there to play with for Australia, and skipper Tim Paine obliged. Sending his side back in to bat, Paine waited for Khawaja to bring up his sorely needed century - alongside another strong half -century from Travis Head - before declaring and setting the tourists a mammoth total of 516 to win the match. Here were the major talking points from the day's play. Khawaja's recent dry spell with the bat has been a particularly big thorn in Australia's side this summer - and boy did Sri Lankan wicketkeeper Niroshan Dickwella enjoy pointing it out in the field midway through day three. Khawaja was victim to a barrage of banter over his noticeable lack of from behind the stumps as he battled his way to 20. "I really want you to get some runs here. I don't want you to feel bad ... after that series (against India) watching your team play on TV," he said. "This is his last innings boys. Like (the) Marsh brothers. Remember (the) Marsh brothers?" Speaking to Neroli Meadows as he walked off for the tea break, Dickwella said the tourists were hellbent on restricting Khawaja from scoring in the second innings. "He's trying to get some runs under his belt and I know he was struggling in the series and we want to make it harder for him," Dickwella said. But after all the ribbing on-camera, a passing moment from the Sri Lankan keeper proved the respect the tourists had for the 31-year-old as he overcame a mental hurdle and passed 50 for just the second time this summer. For all the banter.... nice to see Dickwella clap Khawaja’s fifty just now. Great bunch of guys in this Sri Lankan team. 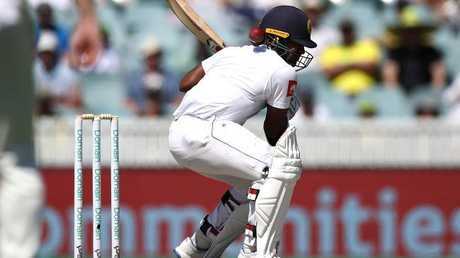 Another bouncer to the helmet sent a scare through the Sri Lankan camp on the third morning when a Jhye Richardson bouncer caught Kusal Perera by surprise. 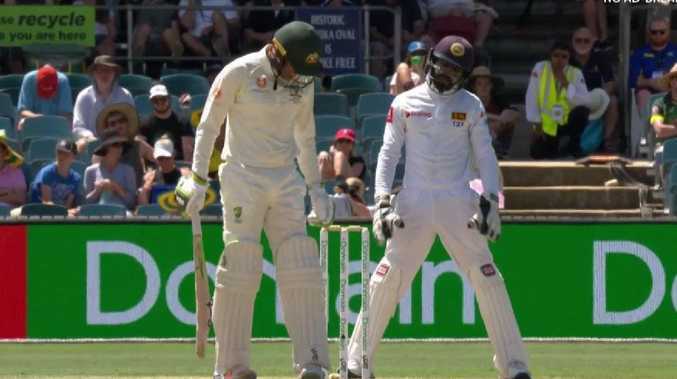 The Sri Lankan star's neck guard was completely removed by the blow, but it wasn't enough to send him to the deck like Dimuth Karunaratne's scary ordeal on Saturday. Perera looked good to go after getting a replacement helmet but lasted only a few overs before the team doctor came out to check on the rattled star. After another brief break he was cleared to stay at the crease, but lasted just a few more balls before walking off the field. "He was in no state to continue," Mark Howard said. Former Aussie star and Fox Sports commentator Brendon Julian says he'd drop the sword on Mitchell Starc and Usman Khawaja for the Ashes, urging selectors to go with a host of young guns for the upcoming tour of England. 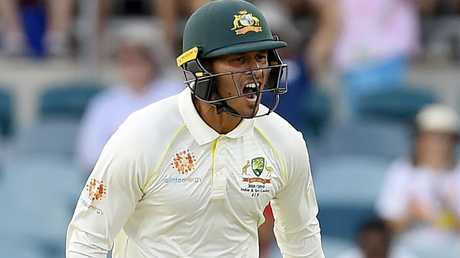 Khawaja has been especially lean this summer, scoring just one half century in the first five Tests. A comeback innings of 101 not out - which followed a duck in the first - was simply too little, too late for the struggling Aussie star. Speaking on a live Q&A chat on Fox Sports, the former Aussie seamer shared his honest thoughts on who he'd pick for the British Isles. "I don't know but I haven't got him in my Ashes squad," Julian said after being asked what was the cure to Khawaja's slump. Julian, who played seven Tests for Australia in the 1990s, also axed Starc from his proposed XI, opting for rising 22-year-old seamer Jhye Richardson instead. 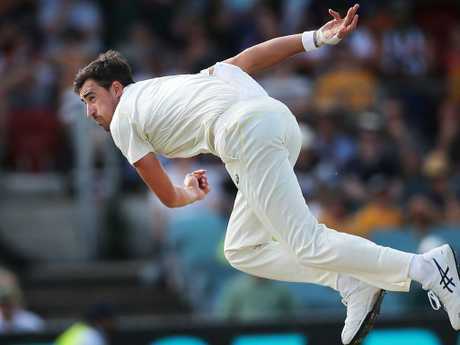 Starc had a similar run to Khawaja with a lean summer of wickets before breaking a year-long drought of five wicket hauls on Wednesday. A blockbuster World Cup performance with the white ball will surely be on Starc's mind to sway selectors away from the axe. Julian also backed Matthew Wade, who has been a shining light with the bat in this year's Sheffield Shield, to make a return to the baggy green. "You need a back-up keeper and he's a very good batsman," Julian said. Julian's proposed Ashes XI: David Warner, Joe Burns, Marnus Labuschagne, Steve Smith, Travis Head, Kurtis Patterson, Tim Paine, Pat Cummins, Jhye Richardson, Nathan Lyon, Josh Hazlewood.